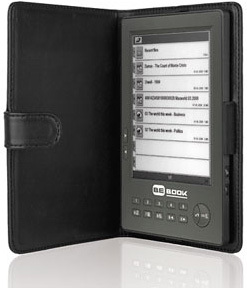 BeBook eBook Reader Now Available… In The UK | OhGizmo! By Andrew Liszewski on 11/04/08 • Leave a comment! I’m definitely sold on the idea of an eBook reader, but so far the only ones I’ve actually had a chance to play with are Sony’s offerings. And unfortunately they don’t handle or resize PDFs as well as I hoped, which is a problem for me given the majority of my eBook collection is PDF files. So I’m hopeful that one of Sony’s competitors will step up to the plate and include some really great PDF support in their own reader, and while I don’t know if the BeBook is my knight in shining PDF armor, it does appear to be a pretty decent alternative. The BeBook supports a wide range of eBook and document formats including pdf, mobi, prc, epub, lit, txt, fb2, doc, html, rtf, djvu, wol, ppt, mbp, and chm as well as other media formats like bmp, jpg, png, gif, tif, rar, zip and even MP3s which can be enjoyed via a standard 3.5mm headphone jack. It also supports RSS feeds, though since it’s lacking any wireless capabilities I assume they’ll only be updated when you sync the BeBook with your PC. Other features include a half-gig of built-in storage that can be infinitely expanded via SD cards, an 800×600 pixel display and a 950mAh lithium-ion battery that’s good for about 7,000 page turns on a 3-hour charge. You can pick one up from Widget.com for about $360.